The highlight of last week was to be the announcement of this year’s special edition teeshirt design but that was before we got the news on Joli. The theme had been chose, we’d been through Dennis’ photos, found the perfect image, the design had been created, tweaked and finalized and we were all set to go. Then Joli died and I seriously considered redesigning the shirt except that we had a wonderful design of Joli a couple of years ago and this year’s design is very specific and not something I was eager to give up and it wouldn’t work next year. So, we have kept the design but we are working on a special gift for donors (more on that in another post). As mentioned in my last blog entry, Joli fostered one of Bristol’s and Sundance’s three chicks this year. Bristol is one of two daughters and one of four chicks from the only nest of Beau and Beatrix at West Winnipeg in 2014. 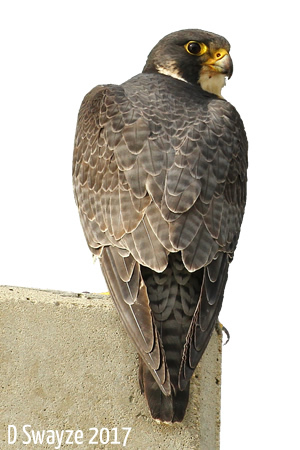 One of Bristol’s siblings, Beaumont, died this year in downtown Winnipeg – first we had seen of him since he fledged. Their other two siblings, Bishop & Belle, we know nothing about (yet?). Bristol was spotted last spring in Grand Forks hanging out briefly with her nephew Marv before aunt Terminator returned home. 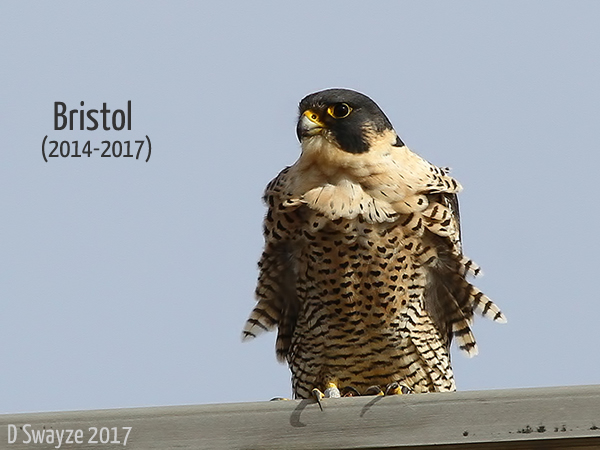 We saw her later in 2016 with Sundance from Logan and Kelly from Brandon flying around a roost site that has been used before by our peregrines. Sundance is from Joli’s and Cowboy’s only nest together in 2013. He had two brothers – Butch and Carver – who like Belle and Bishop we have yet to hear from/about. It wasn’t until this year however that Bristol and Sundance settle down to nest – at three and four years old respectively, they were at the perfect age to start their dynasty – and dynasty is exactly what we were hoping for. Bristol comes from two great lines – Beau of West Winnipeg and Beatrix daughter of Princess from the Radisson and Sundance from the Fargo line of Dakota Ace and the pre-Princess Radisson-McKenzie Seeds genetic line. We were looking forward to seeing what kind of alchemy this pair might be produce. Sundance and Bristol did nicely this spring except for their choice of nestsite – well their choice initially look technically pretty good, but it is a site with its own set of challenges. But what location is perfect? Our fertile little minds had already started to formulate plans to hopefully provide them with more secure accommodations for next year. And just when we were confident that Bristol and Sundace and their little family were thriving, we got the call – one of the chicks had been separated from its nestmates and we weren’t going to be able to safely return it to the nest and worse, Bristol was dead. We aren’t sure if Bristol died taking care of her displaced chick or protecting it from we aren’t sure what, but the result was the same. With Bristol’s death, not being able to put her displaced chick back suddenly became a good thing because it meant one less chick for single-parent Sundance to raise – and they were still young enough to require a substantial amount of parental care. Bristol’s displaced chick we found to be a female when we banded her and we named her Bridget in honour of her mother who in turn had been named in part after her parents, Beau and Beatrix. We had two choices to foster the chick – she was about the same age as the three Radisson chicks but she was so much larger in size that we decided to try and foster her with grand-mother Joli and uncle Hart at Logan – this year’s Logan chicks were a bit older but they were much closer in size. Sundance’s and Bristol’s other two chicks, a male (Sam) and female (Starr) we decided we would leave unbanded so as not to further stress them or their father. As a single parent of two rapidly growing chicks, Sundance had his talons full and the last thing we wanted was for him to have an accident defending his remaining young from us. Just as we kept a close watch on Bridget and her relationship with her cousins, we also watched over Sundance, Sam and Starr and Sundance made single parenthood look easy – a huge accomplishment for any parent, let alone a first-time parent. Sam and Starr were fat, happy and grew like weeds and fledged without incident. When last we saw them they were chasing each other about while their father watched over them serenely. While Bristol’s death was the bitter, watching the rest of her little family thrive when we could have lost them all, was definitely the sweet. We would have liked to have seen Bristol and Sundance together for years, like Princess and Trey at the Radisson or Joli and Hart at Logan, but a peregrine’s life is never predictable and this year we had precious little predictable in our peregrines’ lives. In honour of Bristol, this year’s special edition teeshirt design is of Bristol sitting quietly looking over her shoulder with the quote “There is no greater warrior than a mother protecting her child.” by N K Jemison. As short as her life was and as courageous as was her death, she definitely made an impression on the Project and we hope that that spark continues on in her offspring.